What is a Covered Call and Why are They So Popular? What is a Covered Call, you ask? It is something that turns you into someone who instead of just owning shares, also effectively rents them out in much the same way that a real estate investor does. The advantage with 'renting shares' is that you don't have any of the hassles that come with having tenants and also much greater flexibility in terms of the amount you need to invest for an income stream. The downside is, that unlike real estate, the value of the shares you have purchased can fall in the short term so that the 'rental' income is offset by the capital loss, making your position potentially untenable. The value of real estate may fall but you can still continue renting it for an amount that won't put your rights to ownership in jeopardy. This is not always the case with covered calls. But there are things you can do to protect yourself. So ... to get back to the question 'what is a covered call' ... it is essentially a process of selling call options over shares that you already own, or preferably, have just purchased. 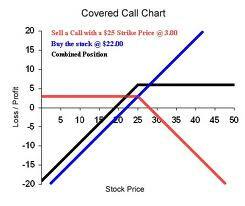 If you purchase shares and simultaneously sell call options, it is called a 'buy-write'. The reason it is called "covered" is because the underlying asset covers the risk inherent in selling the call options. If you didn't own the corresponding number of shares in a call option contract, it would be called a "naked" position, as opposed to "covered". A "naked" position has "almost" unlimited risk for reasons which we will now explain. Let's say you sold call options over 1,000 shares in XYZ company, for a strike price of $25 and expiration one month out - but without actually owning the shares. By expiration date, the price of XYZ rises to $45 per share. This would mean that someone "out there" who purchased the call options could "call" on you to sell them the shares for $25 but to do so, you would have to purchase them at the current market price of $45, realizing a loss of $20 per share times 1,000 = $20,000 loss. What if the price had risen to $65? ... you would now have to purchase at $65 and sell for only $25. I think you get the idea. For naked calls, your risk is only limited by the potential upward movement in share price - which theoretically has no limit at all. Most brokers would not allow you to take positions like this unless you have funds to cover the possible consequences ... and then close out your position automatically once your equity with them is threatened. What is a Covered Call Risk Profile? So what is a covered call and does it contain the same inherent risk as a naked call? Absolutely not! With covered calls, you already own the underlying shares related to the call options you have sold, so any price rise will work in your favour - the extent to which will depend on the option strike price you have agreed to. So when you do a 'buy-write' or covered call trade, what is the best alternative? Sell "out of the money", "at the money" or "in the money" call options over your shares? We will look at this in more detail when we consider your covered call strategy alternatives in another section. Covered calls are considered to be one of the safest option trading strategies, particularly for investors who are more longer term focussed and are not relying so much on it for an income stream. This doesn't mean you can't provide a regular income stream from the process. Quite the contrary! But if you don't need income from it every month and are prepared to ride out the fluctuations in the market, covered call options, written (sold) with the right timing, can give your share portfolio that extra bonus in addition to dividends. For this reason, it is the only acceptable option trading strategy approved for self managed 401k retirement funds in the USA.